IRAP Funding Awards $500k to InMed Pharmaceuticals Inc.
HomeBlogGovernment FundingIRAP Funding Awards $500k to InMed Pharmaceuticals Inc.
InMed Pharmaceuticals Inc., located in Vancouver, British Columbia, is a biopharmaceutical company engaged in the discovery and development of novel, cannabinoid-based therapeutics for the treatment of diseases that have high unmet medical need. The organization has recently received Canadian government funding to support their research and development efforts in cannabinoid biosynthesis. The Industrial Research Assistance Program (IRAP) has awarded InMed Pharmaceuticals $500,000 in grants for their advanced cannabinoid biosynthesis technology. Administered and managed by the National Research Council of Canada (NRC), the Industrial Research Assistance Program (IRAP) offers businesses research and development funding to support the progression and commercialization of innovative technologies, while accelerating growth and competitiveness. IRAP funding will help InMed continue their efforts to in expand the number of cannabinoids produced with the company’s technology platform. InMed Pharmaceuticals is in the course of developing a microbial-based biosynthesis process which will allow a vast variety of cannabinoids (90+) from natural sources to be manufactured. InMed is the recipient of $500k in research and development funding from the Industrial Research Assistance Program. Funding from the Industrial Research Assistance Program will be used to enhance production of different components of the terpenoid biosynthetic pathway, a foundation of cannabinoid production. The funding is also permitting the company to further research and development supporting scale-up activities run by InMed’s contract development and manufacture organizations. These activities will help position InMed as a leader in the field of cannabinoid biosynthesis. The Industrial Research Assistance Program (IRAP) is a Canadian government funding program designed to accelerate and commercialize research and development projects from SME Canadian innovators. The program supports project types including process or product development, product commercialization, and process or product improvements. Large-scale technology adoption projects that lead to new capabilities are also considered. Via IRAP’s multiple streams, businesses may receive up to 50-80% of eligible costs to a maximum of $10 million. IRAP Accelerated Review Process (ARP): This stream focuses on smaller-scale projects that aim to solve internal technical challenges. IRAP Mid-Size Projects: This stream focuses on large-scale R&D innovative product development projects. The next round of funding through the Industrial Research Assistance Program is expected to be released in April 2019. 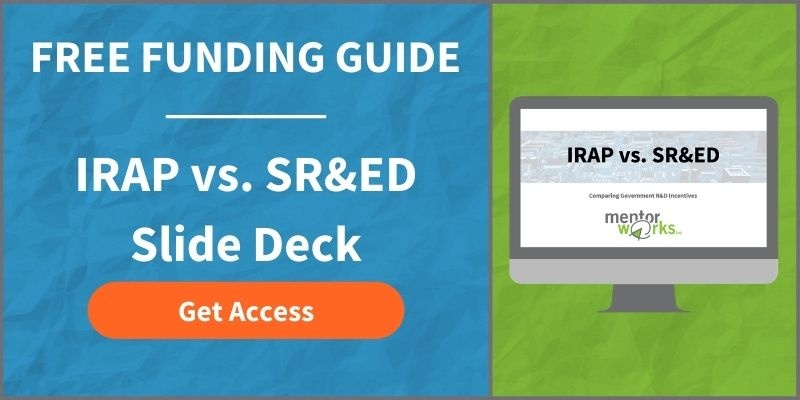 If your company is interested in learning more about IRAP and whether this program is the right fit for your research and innovation projects, please download Mentor Works’ IRAP vs. SR&ED slide deck. Myra Bredin holds a Diploma of Business Marketing at Conestoga College. Her interest in blog writing, social media and event planning makes her excited to be Mentor Works’ Marketing Analyst, where she can use these skills to educate and support Canadian businesses with government funding.